As we enter the mid-term election season, it seems like there is more talk about the 2016 Presidential election than the current 2014 elections. Tongues are also frantically beginning to wag as to who will succeed Obama. But why do we limit our presidents to 2 terms in office? About 458 B.C. Rome was attacked by the Aequi. At a critical moment, the Roman Senate turned to Cincinnatus for help. They elected him dictator for a 6 month period, informing him while he was tending his 4 acre farm. Honoring this appointment, Cincinnatus left his plow in the field, his wife in the house and traveled to Rome to assume his position. After choosing his second in command, Tarquitius, and ordering all men of military age to service, he engaged in fighting against the Aequi. He personally led the infantry while Tarquitius commanded the cavalry. Surprised by the double attack, the Aequi were easily defeated and were soon begging for mercy from the newly elected dictator. Showing compassion, Cincinnatus spared the lives of the remaining enemy soldiers under the condition that they surrender their leader. With the war over, Cincinnatus sent his army home, resigned his position, and returned to his family and farm. How long was he dictator? Fifteen days. Not a day longer than necessary. Because of the selflessness, integrity, and uniqueness of the actions of Cincinnatus, he has been revered and respected by people to this day. He was taught about in schools and written about in poetry even at the time of America’s founding some 2200 years later. He also inspired other great leaders, such as George Washington, often referred to in his day as the American Cincinnatus. Though it took a little more than 15 days, after being called out of retirement on his farm by his country to command the Continental Army, Washington was led by nothing less than duty and responsibility to the cause of freedom. While so many before him took the torch they were given and ruled for their lifetime or until their defeat, Washington, like Cincinnatus, viewed military and service as it was intended to be, service. He slept in the freezing cold at Valley Forge along with his men and he rallied his troops from the front on top of his horse, often drawing the fire of the enemy. Washington was never one to demand anymore from someone that he was not willing to do himself. And he never expected to be pampered or protected like royalty. Upon hearing that Washington would return to his farm after he won independence for America, King George III stated, “If he does that, he will be the greatest man in the world.” The notion of giving up power was actually a very rare concept until America. Dictatorships, monarchies, emperorships, all these governments revolve around political power being for life and then passed from generation to generation. Only bloodshed and war unseated a ruler. That is until America. That is until George Washington. It was not long after the end of the Revolutionary War until Washington was called away from his farm again by his country, this time to participate in the Constitutional Convention of 1787 to which he was unanimously voted president of the meeting. His ethics, his morals, and the way he led his life was not only the perfect example of American Exeptionalism, it is a personal standard a vast majority are still trying to live up to today. (see God's Divine Providence) Washington was not loved and adored because he could give good speeches or he promised voters the moon. He was respected and admired because of his humility, his faithfulness to God and country (in that order), and his trustworthiness. Who better to be the first person to be given the powerful position of Presidency than someone who does not live for power. At the conclusion of his second term, Washington informed the citizens that he would not seek a third. This was the second time Washington walked away from absolute power, authority and entitlement. He spent years defeating a monarchy. Why would he then establish one here? Our Constitution did not originally put a limit on the number of terms the President could serve in office. It only defined a single term as 4 years. Washington knew the amazing importance of his position and how his actions would shape that office for decades to come. It would have been so easy to live out the rest of his life as President of the United States. There is no doubt he would have won election after election. But, contrary to what the progressive movement is trying to ignore, Washington was a Godly man. Because of this he was self-disciplined and believed if citizens followed God and his commands then they would be more than capable of governing themselves. It was not meant for one man to rule over the people but for the people to rule themselves. This meant a real change in leadership on a regular basis to which Washington led by example. Out of respect for the "Father of Our Country" and following his model, none of the next 30 presidents that held a second term received a third. It was not until Democrat Franklin D. Roosevelt that any president was granted an extended tenure. After his death at the beginning of his 4th term, Congress quickly passed an amendment that restored the unwritten precedent set by Washington to the Office of the President limiting the number of terms served to 2. In 1783 the military preservation organization, called the Society of the Cincinnati, was formed with the motto Omnia reliquit servare rempublicam ("He relinquished everything to save the Republic") emphasizing the selfless service of the military. The Society had three goals: "To preserve the rights so dearly won; to promote the continuing union of the states; and to assist members in need, their widows, and their orphans." It was no surprise that General George Washington was elected their first president. A few years later a small village in Southwest Ohio borrowed the Society’s name and became the thriving city of Cincinnati. 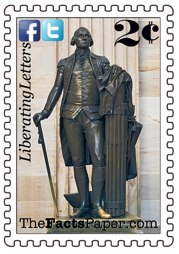 Liberty, since you were born and are being raised in Cincinnati, my hope is that from now on, every time you write or see your city name, you remember the story of Cincinnatus and more relevantly Washington. I want you to remember the true meaning of military and public service and the example these two men have given us. So whenever a politician pompously proclaims that he has been in office 40 years, you have the wisdom to know that is actually a mark of disgrace, not a badge of honor. Government was never meant to be saturated with career politicians who exempt themselves from the laws they write and broker deals that make them rich. It was supposed to be run by hardworking farmers, miners, engineers, shop owners, ranchers, architects, doctors, entrepreneurs, inventors, educators, and yes, even clergy, bankers and lawyers, who have more love for their land, trade, and fellow citizens than power and authority.